I love apricot jam. For me, there is little better than fresh croissants with butter and apricot jam. I'm not a huge breakfast fan, but croissants and jam make the perfect occasional treat. 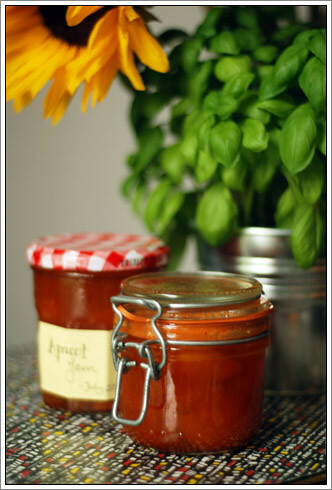 Apricot jam isn't just a breakfast treat though - it is frequently used in baking, so you'd be wise to keep a jar handy. I have always been a fan of the Bonne Maman apricot jams - no other shop-bought ones will do. However, since I learned how to make my own I fear they may well be out of a customer. Next step is clearly making my own raspberry jam! Making jam is not complicated in the slightest. All you need is a little time on your hands and some patience. Slice the apricots in half or into quarters, depending on their size, and discard the stones. Place in a large bowl and stir in the sugar. Cover with a teatowel and leave in a cool dry place for up to 18 hours. I stirred it a couple of times to make sure everything was evenly coated. Place two saucers in the fridge the night before - you will need these to test the jam when you make it. When you're ready to make the jam, sterilise two Bonne Maman-sized jam jars (370g approx) by placing in a cool oven and bringing it up to 140°C. When the oven reaches temperature, leave the jam jars there, but transfer the apricot and sugar mixture to a large saucepan and bring to the boil. Once it reaches the boil, let it simmer for 15-20 minutes. The bubbles should be large by this point. Remove one of the saucers from the fridge and place just under a teaspoon of jam on it and leave to cool for a couple of minutes. If the jam is still runny, cook it for a further five minutes or so. If it looks like it sets, turn off the heat, remove your jam jars from the oven and transfer the jam from the pan into the two jars. Screw the lids on tightly and leave to cool. Store your jam in the fridge - it will keep for up to 6 months. With thanks to Red Apple Delivery for the inspiration!